In these ever-hotter days, many families look to invest in an air conditioner of one sort or another to help keep temperatures inside the house at a comfortable level. These appliances range from window sill units to built-in cooling systems. Regardless of which one you choose, there are a few things you can do to maximize the cooling effects on your home and keep your utility bills reasonably low throughout the summer months. Keep doors open to maximize the effects of your air conditioning unit. 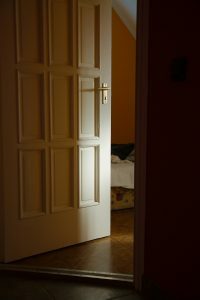 While it may seem like the obvious choice to close off a bedroom door while the air conditioner is running to keep the cold air in, this practice is actually causing hot air to come into your house! The principles of cooling and heating air are based on air flow. As cooler air is pushed into the room it pushes out the stagnant, hotter air. If this process is hindered by closed doors and windows, the room becomes pressurized. The air will find a way out somehow- usually by drawing air in from the outside. This air, in most cases, is warm and can contain higher levels of humidity and carbon monoxide. Obviously you won’t want to keep all doors and windows open while you run your air conditioner, but keeping the inside doors open to enable easy air flow will get more cold air circulating through the house at a much faster rate. Close blinds and drapes against the sun’s strongest rays. Even with the use of an air conditioner, there are simple things you can do in your home to lower the impact of the appliance on your utility bills. 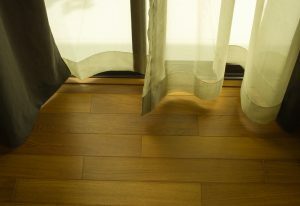 Keeping blinds and drapes closed when the sun comes through them, and opening windows at night to let cool air in are two easy things to incorporate into your daily summer routine. Make sure you are not straining your air conditioner by asking it to cool a much larger room than it is equipped for. Information on the packaging will help you determine how big of a space each unit is equipped to handle. An over-worked air conditioner can be, at best, ineffective and, at worst, dangerous. Look for the Energy Star logo to denote efficient appliances. 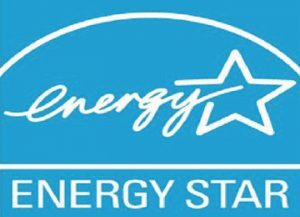 The Energy Star rating was created by the EPA in 1992 to label appliances with high energy efficiency. These ratings are now widespread and can help you find the most efficient air conditioner for your particular space. So often the unbearable feeling of an overheated house has more to do with accumulated humidity than it does merely temperature alone. Air conditioners will often profess to manage both humidity and temperature, but these happen simultaneously. By using exhaust fans when you engage in humidity-producing activities like bathing, washing dishes, and cooking, you can help significantly lower the water levels in your air, making the air conditioner work more effectively and efficiently. Proper installation and maintenance are equally important as you bring these new appliances into your home this summer. But with a high-quality machine and a few daily practices you can easily enjoy the summer months in cooled-air comfort. This entry was posted in Dream Home, Family Home, House Improvement, Housing News and tagged Air Conditioner, beat the heat, dream home, money saving tips on June 23, 2016 by Admin. When planning to build your dream home, there are many decisions to be made. Options for house siding are many, and each has its share of benefits and drawbacks. Wood is the classic siding choice, and has many applications. Clapboards (horizontal siding), shingles, and board-and-batten are all popular choices and have been used for hundreds of years. Wood siding requires some regular maintenance depending on the way you use it, but it is quite durable and aesthetically pleasing. Synthetic options exist as an alternative to the cost of using wood siding. Cement fiber, seamless steel, and engineered wood are some oft-used choices, and they boast longer lifespans with less maintenance. A mixture of cement, water, and inert materials like lime or sand make up the material known as stucco. It is painted on the side of a building and can be tinted any color you wish, negating the need to paint your walls in the future. It is very inexpensive and long-lasting and can easily be applied by the savvy DIY-er. Few siding options gave that classic old-fashioned look like brick does. Known for its durability and strength, many old buildings sided with brick are still standing and in good working order today. Brick is heavy and can be expensive, and installation labor will add to the cost of the materials. Synthetic brick veneers are available at a lesser cost and are thought to maintain well over the years, but the material has not been on the market long enough to test this claim. 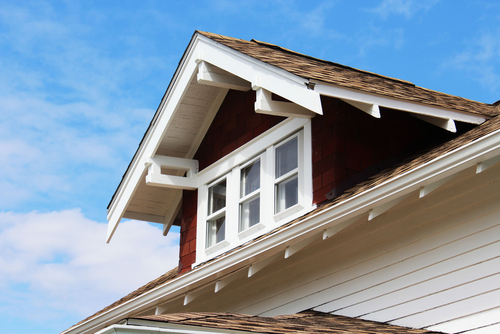 Vinyl siding is an inexpensive, durable, and low-maintenance option often used in houses. Made of PVC plastic and tinted throughout, scratches and nicks are difficult to spot, but vinyl will eventually fade and possibly crack as the years go by. It is lightweight and easy to install and requires very little prep work beforehand. Siding the full exterior of your home with stone is impractical and prohibitively expensive, but for hundreds of years houses were built entirely out of this durable material. Home owners today will often use stone as an accent and even this truncated application can be costly to purchase and install. Synthetic options are on the market that can bring the cost down but aesthetically there is some debate about whether or not the look of synthetic stone is close enough to the real thing to be a good alternative. Whichever option you choose for your dream home, spend some time researching your options. You’ll want to consider the cost of materials, installation, labor and prep work required, and overall longevity of your chosen material as factors in your decision. This entry was posted in Dream Home, Family Home, Home Buying, House Improvement, Housing News and tagged dream home, housing siding on May 23, 2016 by Admin. If your chosen house plan offers lots of windows for light this also means the potential for high heat gains and losses as the seasons change. But worry not—there are several options for window treatments to save you money that can complete the look of your home at the same time. Awnings are versatile structures built onto the outside of your home above the windows. These days they are typically made of synthetic fabrics which are treated for water and mildew resistance, which greatly extends the life of your awning material. 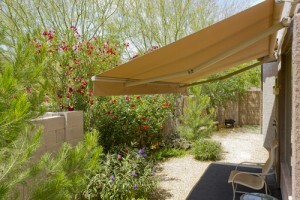 It is also possible to have awnings built with solar panels, thus maximizing the energy efficiency of the construction. These tend to offer a more seamless look with the outside of the home, as opposed to having a few solar panels mounted to the roof. They serve the same purpose as fabric awnings, in that they block and redirect sunlight from entering into the home through the windows. However, they are storing energy at the same time for use elsewhere in your home. It is a very efficient, if sometimes costly, option. Inside blinds are affixed to the tops of windows and can be raised and lowered to adjust sunlight entering the room. 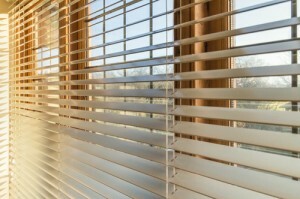 Exterior blinds are usually made out of steel, aluminum, wood, or vinyl. These are also mounted atop the windows and are lowered into tracks; when the blinds are fully lowered, the slats come together to block the light. If partially raised or lowered they can help with air ventilation and indirect light levels. As a general rule, blinds are more successful at blocking heat in the summer months than they are at keeping it in in the winter. While most people will consider draperies in their decorating schemes, they often do not realize that material and aesthetic choices have a big impact on the heat levels in the room. 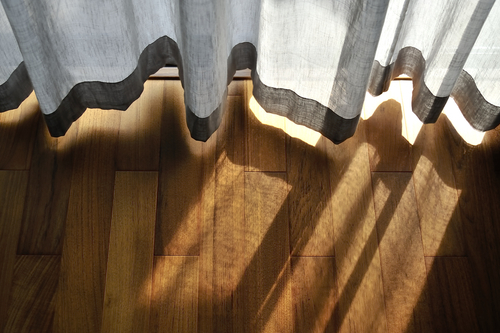 Simply sewing a light-blocking panel to the back of each curtain can make a huge difference in summer heat reduction and winter heat retention. For maximum efficiency, drapes should be allowed to hang down to the window sill or the floor, and should be affixed to the wall at the top, thus sealing in the air between the window and the fabric. If built properly, overhangs can be one of the very best heat solutions your house can have, especially if you are working with a large southern exposure. Overhangs can direct sunlight away in summer and allow light to enter in winter, but use caution: well-designed overhangs are usually built in during the home construction process, as they require a high degree of expert knowledge to place them appropriately. Some of the elements to consider when adding overhangs are the latitude of the property, illuminance levels, window size and type, and regional climate. When you choose a house plan that can be customized your architect can include overhangs that meet the placement requirements for energy efficiency and aesthetic appeal. Unless you are Bill Gates or Warren Buffet, you are probably going to need to take out a loan to build your dream home. There are a number of different routes that you can take when you go to get your loan, and each type of home loan comes with its own list of positives and negatives. It’s important to consider each type of loan from a number of different people and institutions before you pull the trigger and get that cash. There are different sets of requirements that come with each type of loan as well, so you need to be careful about what you agree to do with your new home. FHA loans are the type of mortgage that most people are going to end up using because they are the easiest to obtain. When you go to apply for this type of loan, you will need to provide the normal loan application materials such as current debt levels, credit score and proof of income. If you are pre-approved after providing these materials, you will then be given a maximum amount that you can spend while you build your home. It is vitally important that you do not exceed the maximum loan amount while you build your dream home. VA loans are basically a version of FHA loans that give special treatment to veterans. VA loans usually come with a lower rate of interest, but the catch is that you have to make sure that the home follows certain energy efficiency guidelines. Adjustable rate loans will allow you to get more money up-front than any other type of loan. Since you will be able to qualify for more cash, it is much easier to make sure that you can fit your dream home inside of your loan’s allowed budget. These loans will come with low interest rates at first, but they will begin to rise as the years go by. It’s important to make sure that you will be able to handle the increased interest payments in the future with this type of loan. The last type of loan you can look at when it comes to building your dream home is a conventional loan. These kinds of loans will give you the ability to have more control when it comes time to pay for construction costs, but they are usually not the best idea if you are purchasing your home from a tract builder. The most important thing to remember after you get your loan is that you need to stick with your allocated budget. You will probably have to get rid of a few ideas or tweak some of the nicer things that you were going to place in the home, but building your own dream home is still the best route to take if you want to live in the perfect house. Brent Taylor writes issues related to mortgage loans and financial matters. He writes for Mortgage Loan, a site that provides daily news and articles since 1995. This entry was posted in Housing News on December 6, 2012 by HouseplanGuy. Pending home sales have increased for the second consecutive month, according to the National Association of Realtors®. At MonsterHousePlans.com, we are excited at this news, but realize it is just the beginning. 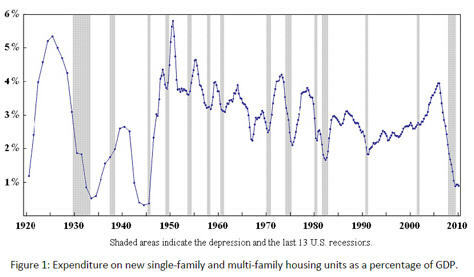 Housing always leads the country out of recessions. However, this one might be different. 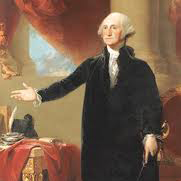 We have added 5 trillion dollars to the US debt since 2007, but Speaker Pelosi promised that we were entering a new era of “pay as you go” and “there will be no increase to the national debt” It hasn’t quite worked out that way. This, and other policies recently enacted could bring a screeching halt to any recovery most of us are counting on. However, we can stop this. We can vote. Anyone that has ever balanced a checkbook knows that our current rate of spending is unsustainable. We need to vote in new representatives that actually possess character and fiscal disipline. Let’s return this country the values it was founded on. Personal responsibility and self-reliance. This entry was posted in Housing News on October 25, 2010 by HouseplanGuy. At least some analysts are bullish on housing. Wheaton believes that because there has been so little construction that demand exceeds the level of building and it will soon absorb excess inventory. “Housing construction will not only rise, but it will stay high for a while, which didn’t happen in previous recoveries,” Wheaton predicts. At MonsterHousePlans.com we believe we are in a “Pre-Boom” period! This entry was posted in Housing News on September 21, 2010 by HouseplanGuy. House starts are up in a California county! 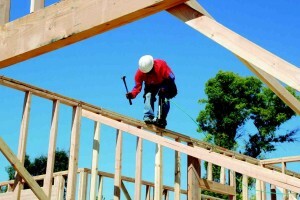 The latest building permit report by Construction Monitor shows that single-family home building in the Central San Joaquin Valley crossed the $300 million mark by Sept. 9.The weekly publication says this year in the region, 1,693 single-family housing permits were granted with a value of $303,992,369. Centex Homes remained the lead builder with 132 homes being erected this year at a value of $22,718,469.K. Hovnanian Homes and Wathen-Castanos Inc. each had 117 homes being erected this year, the former with a value of $19,241,323 and the latter with a value of $18,075,020. Commercial construction was up only slightly from the previous week, the report said, with a year-to-date project value of $230,805,920. At MonsterHousePlans.com, be believe that the best is yet to come. All we need to do is stop reading the headlines about doom and gloom and focus of those things that are positive in all of our lives. This is still a great country filled with great people that are capable of amazing things. We will pull ourselves out of this like we have in the past. This entry was posted in Housing News on September 15, 2010 by HouseplanGuy. This entry was posted in Housing News on September 14, 2010 by HouseplanGuy. Housing starts on the rise! WASHINGTON (Reuters) – New construction of U.S. homes and permits for future building likely rose in September, supported by an improvement in sales and declining stocks of unsold properties, according to a Reuters survey. This entry was posted in Housing News on March 22, 2010 by HouseplanGuy. MonsterHousePlans now has over 19,000 house plans to choose from. Try out our MonsterSearch to select from over 70 design features to narrow your search for house floor plans that will work perfectly for you!